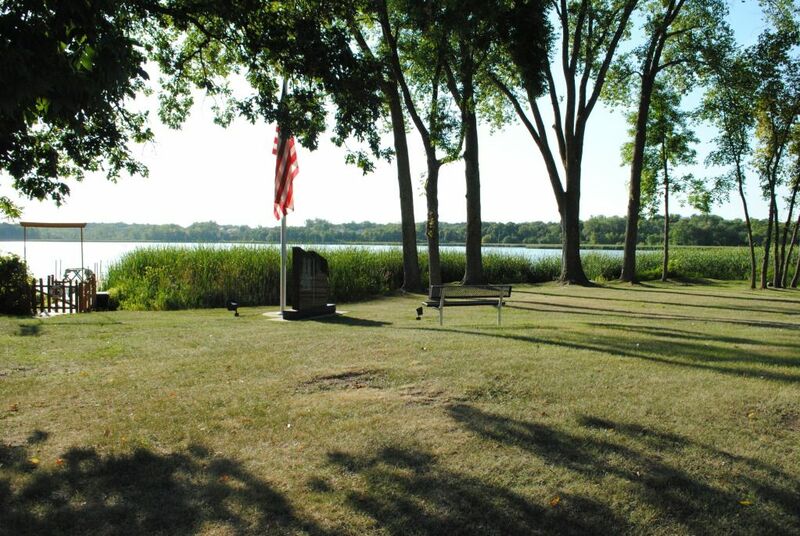 Veteran's Park is a very small park on Langdon Lake, on Commerce Boulevard, next to the Langdon Lake Apartments. 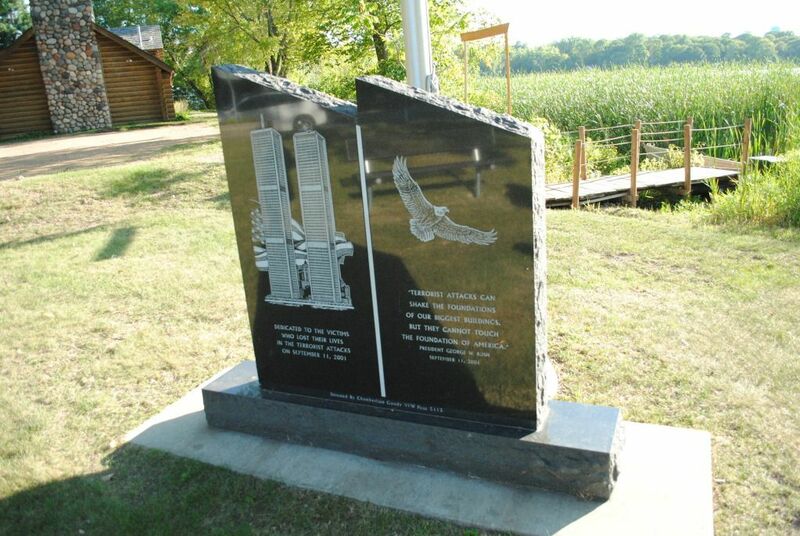 Monument memorializing the 9-11 attacks is the dominate feature of Veteran's Park. I believe this is a very old park, as the city document doesn't show a date the park was created, so may be as old as the city is? Perhaps it was originally the city access to Langdon Lake? A couple of nice benches show this park was built with care. It's quite small, and I imagine it's a nice respite for the apartment residents to be able to use in small ways, though may not be big enough for kids to use except maybe a game a of catch, though they would need to be mindful of the traffic on Commerce. Lake frontage here, but no apparent public dock. I failed to note for sure, but I believe you are allowed to park on the street next to the park. As it's only a couple blocks away from the Veteran's Memorial Plaza, next to the Parking garage noted earlier this week, the park seems redundant. It's clearly been updated recently, and the monument each park has stands for something different, but one has to wonder what the thinking was to have two veteran memorials sitting only a couple of blocks apart. Is this good use of public space? Neither seems to be used very much, so what is the public saying about them? Are they truly valued? We have discussed some about Auditor's Rd, and Mound's future development on the Greenway. When my family moved to Mound in 2004, there was a lot of excitement about this project... only to see a few residences built, and then apparently abandoned by the developer. Since them, Mound is basically just waiting for someone, ANYONE to come in and restart the project, or propose a new one. This is frustrating as it feels like we have little, or no control over this. We just have to sit here, twiddle our thumbs, until someone with a vision (and lots of money) to build this for us. Let's take a moment and look on the other side of Commerce. Over the last year I have heard more and more about Economic Gardening. local entrepreneurs create the companies that bring new wealth and economic growth to a region in the form of jobs, tax revenues, per capita income, and a vibrant local business sector. Economic gardening seeks to focus on growing and nurturing local businesses rather than hunting for "big game" outside the area. I wonder if the City of Mound is doing this in any capacity? 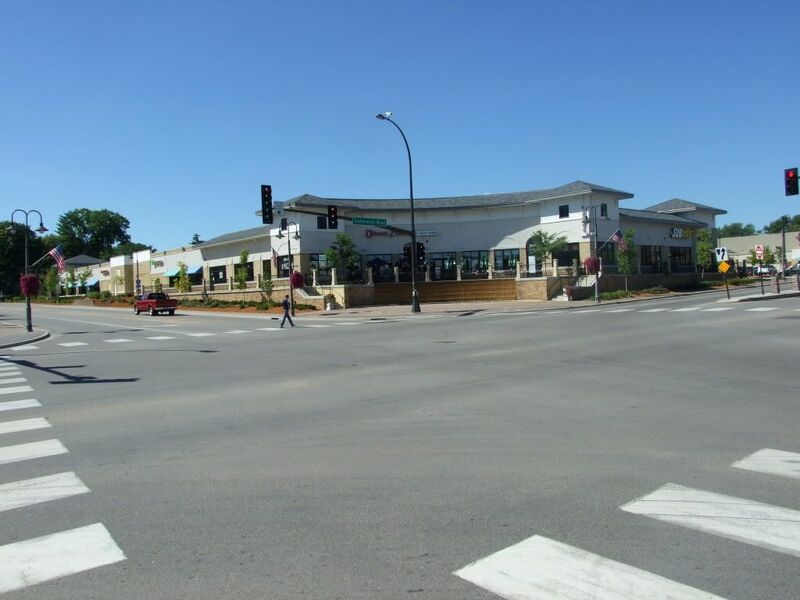 Everyone is excited that Westonka Animal Hospital may be moving the the empty retail space next to Jubilee and the Pond ice arena. Did the city staff help facilitate this? The CUP application was granted rather quickly but apparently Mound Marketplace and the animal hospital are still negotiating terms. 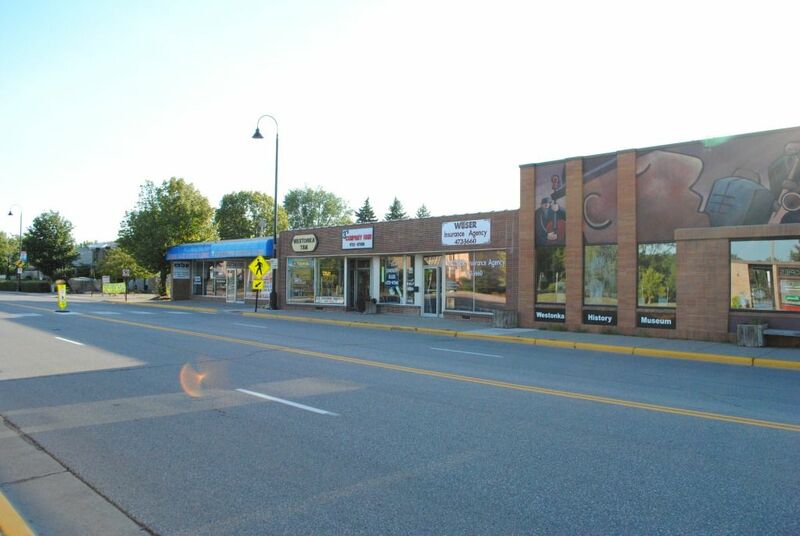 The City of Mound was instrumental with the creation and support of Celebrate Greater Mound, but what about setting up a city environment that is supportive to these businesses. Are there other small businesses looking for an opportunity to get on Commerce? Is this an inviting place to move your business? What about the old store fronts along Commerce. Is the city of Mound doing everything it can? Can the city do more to help these businesses? We, at a Place in Mound, believe there are small, easy fixes that can happen to promote the small businesses that already exist in Mound. It is likely there are several businesses in Mound that people run out of their homes that might be looking for opportunities to expand to be a real storefront. 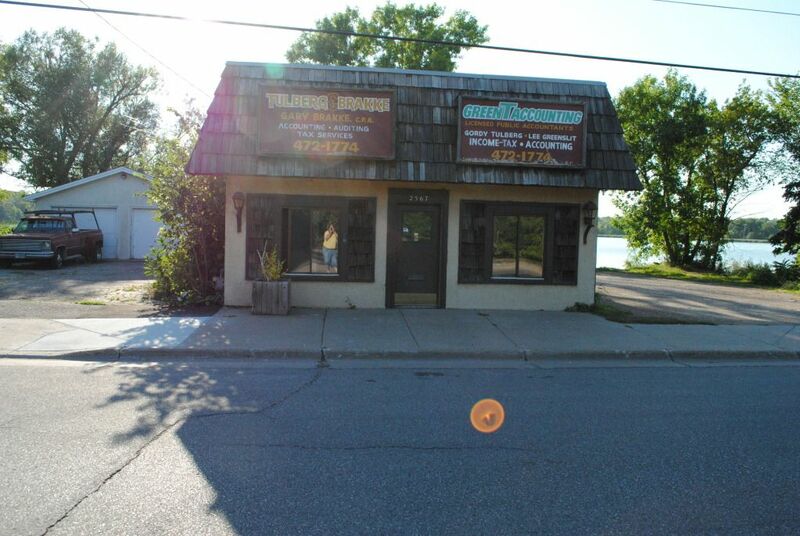 Perhaps there are businesses looking to add a second storefront. Why is a property allowed to sit, essentially abandoned, like this? Is there a way a city can motivate latent land owners to improve their properties? Because it seems like some of these properties are just waiting for another Walgreens to come along, and give them their big pay day. Instead of waiting for something to happen, lets take some simple steps, and MAKE things happen. Thanks to a Navarre Community group, Hennepin County came to ask questions and take input for planning the county's first Pedestrian Plan. They started from broad issues, and then narrowed it down to specifics. It was nice to visit and talk with some other Mound citizens about our issues, as well as hear from folks from Navarre, Minnetonka Beach and Excelsior. If you cannot make a meeting, they do have an online survey you should fill out. As I introduced myself from Mound, some folks were quite complementary about the downtown development of Mound and saying how lucky we are to have Shoreline Dr moved, as it was up to Lynwood. I kept wanting to say, "Yeah, but..." but then I realized what a lot of these folks were comparing it to their own situation, especially in Navarre. Where the cars used to drive through. I actually biked to the meeting, held at the Freshwater Society, and so I got off the trail, went South on 19 through the 15/19 intersection, and had to cross 19. Not a pleasant experience. And there was no shortage of Navarre folks with comments about trying to walk from Lunds to D'vinccis. It is terrible. So please, let me take a moment to praise our city staff and council for their work in setting up a downtown that won't have pedestrians dodging cars. It's so easy to get frustrated when dealing with obstacles, and I have been pretty rough on them when writing here. The Mound city staff and council really do want what's best for Mound, and have those interests at their heart. I still believe we could do many things better of course, and will continue to push for simple, easy ways to make Mound a better place. Yes, we aren't as bad a Navarre, but we got a long way to go still. Why put a streetlight in the middle of a sidewalk? Yesterday I asked who determines what a Place is, while finishing with a picture of Veteran's Memorial Plaza, the circle park next to the parking garage in Mound's downtown. Veteran's Memorial Plaza - Is this a non-place? It is clear the city has developed a public space, and expect people us use this place. 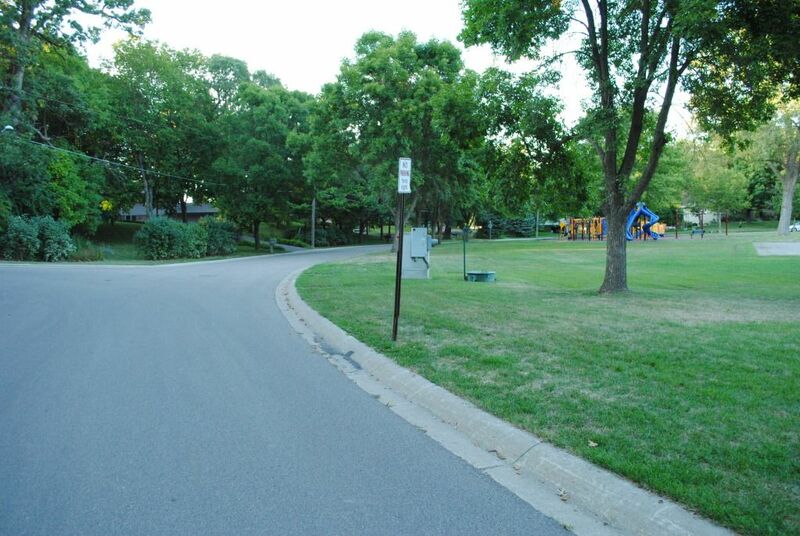 It is well maintained area, always clean, and highly visible to passing motorist and transit users. It was planned, designed, invested heavily by someone (the city or donor?) and was built to be a place of significance, which you can feel when you enter the area. There is definitely a sense of mystique and awe here. There are several benches that face the center of the circle. Unfortunately, it's loud with traffic speeding by, and you feel like you're in a fishbowl, where everyone is watching you when you spend time here. The traffic of course creates a lot of noise as well. Another downside, is with the sense of awe and mystique one feels when you enter the place, it's not one where I as a parent feel free to let my child run around. Lots of people drive by here. Lots of people get on the bus near here. Does anyone ever drive to here? As many times as I go by Veterans Memorial Plaza, I cannot recall a single time I've ever seen the spaced used by anyone. 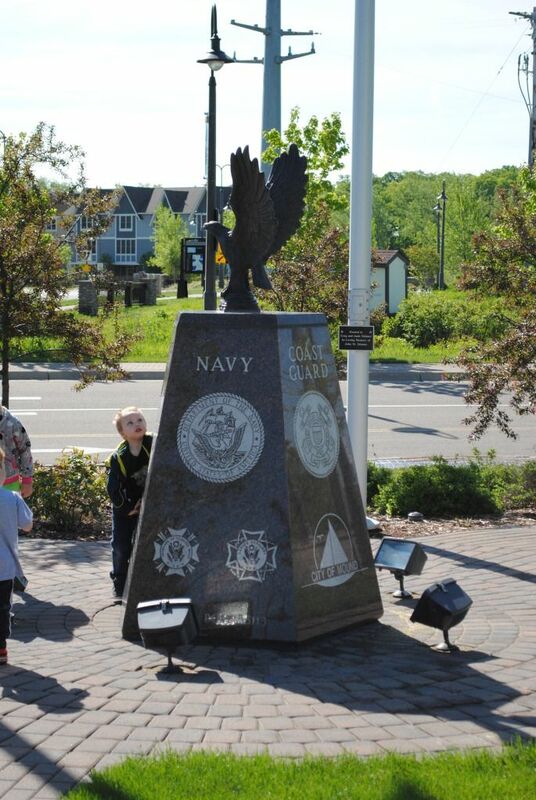 Admiring a monument in Veteran's Memorial Plaza. Clearly there are times when a place like Veteran's Memorial Plaza are needed, and it is important that the city have places like this. But is this effective use of space? What are we, as citizens saying about a place like this if it's not used? Do we not care about a place like this? Do we not value it? Did the city make a mistake in the creation of Veteran's Memorial Plaza? How can we create value here so it is a Place? 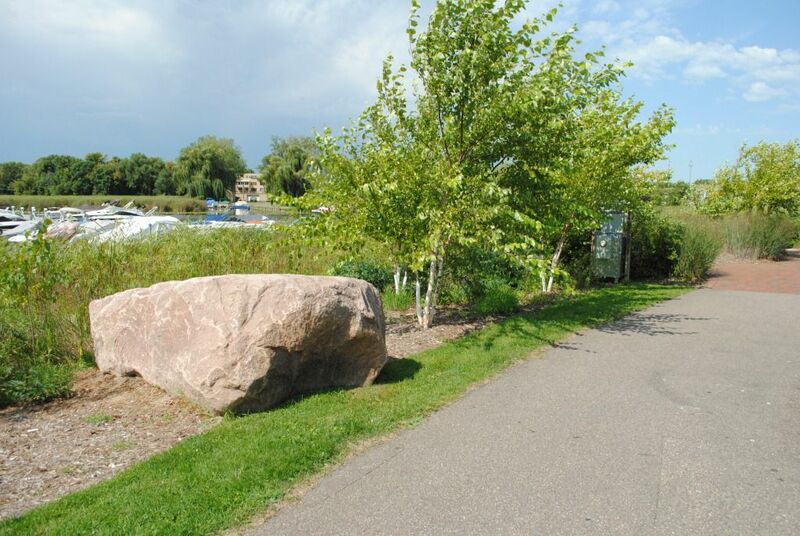 Nearby, the Andrew Sisters Trail is a short trail along part of Lake Minnetonka that was developed and built around the same time. Is was to connect and be a Place for the new downtown of Mound. 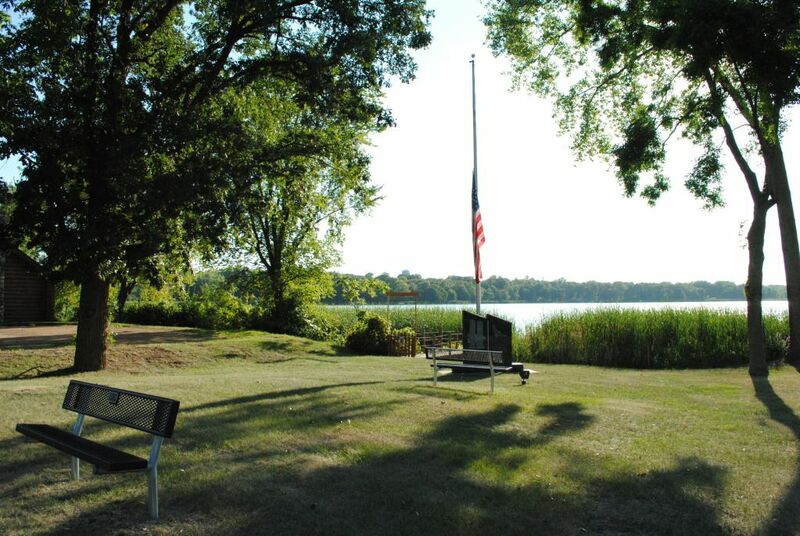 There are several benches overlooking the lake (often not used) as the Andrew Sisters Trial is currently used to connect places currently, more than it is a destination. However this bench has become a regular stop for my kids. 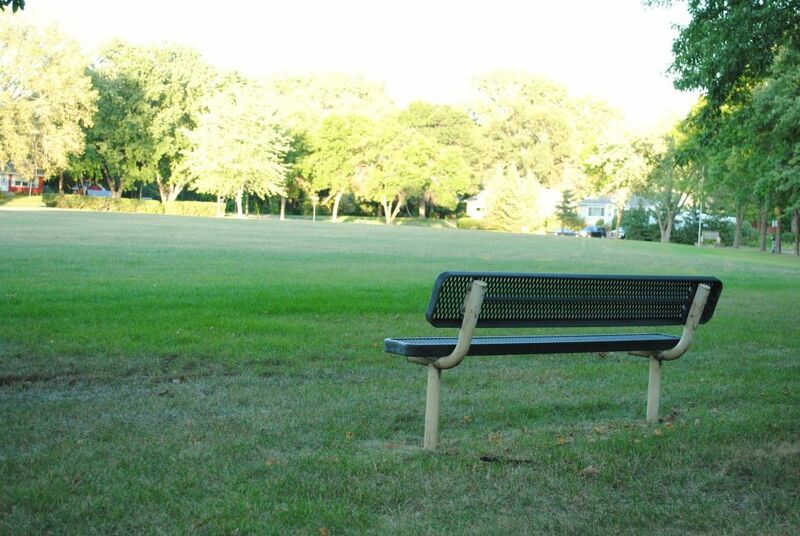 Benches like this are found along the Andrew Sisters Trail, and other parts of downtown Mound. Why would this bench be a place? Because it looks straight at this large rock. And what's so special about that rock? Just ask my daughter, who climbs on it almost every time we walk by here. Clearly someone decided to make a place here, but I imagine it was more happenstance, than anything. It is small, pleasant and quiet. This place is cheaper, and makes use of the natural features of the trail and shoreline. 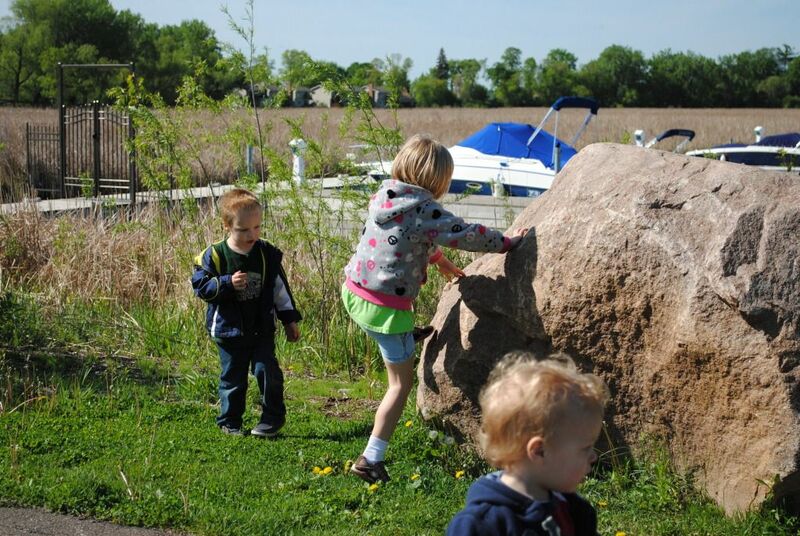 The space here is small and contained, so the kids tend to keep close to the rock. The bench gives dad a chance to take a load off! Clearly if a another child would walk by with their parent, they would have to join the fun, and it gives the parents a chance to connect, which is what a Place is really all about. If a lot of money is spent on a valuable piece of land, the citizens of Mound should expect a return of some sort on that place. In turn, if a place just happens to come along in cheap and interesting ways, that needs to be supported, and encouraged. We need to push for these cheap and organic places to spring up and the city has a responsibility to support these places when and where it can. We want places where people can connect. We want to be able to easily support our local businesses. We want safe places for our children. We want to be able to easily access a place in whatever way WE choose. We want Mound to be a place to drive to, not drive through. Here's a great story about a community stepping up to support a local business, or, as we call them, a place, after the flood made havoc of the town last month. Places where people gather are important for communities. When connections are made, when people who don't know each other talk, when old friends happen upon each other, wonderful things can happen. 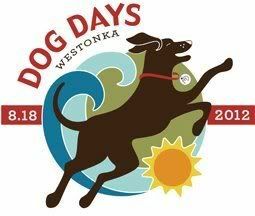 Dog Days Westonka, a place for a day. Is there a place in Mound where people can rally? Is there a core to Mound? If there is, is it being supported by the city? By local business? By it's residents? Who determines what and where that place is? This short article is a great does a great job of talking about what is a place and what is NOT a place, and the grey spots in between. This website has pointed out many places in Mound, we are going to spend some time in the coming days talking about 'non-places'. This is a great TED video from a year ago that relates much to some of the resistance I ran into at Mound City Hall when we were discussing on street parking along Surfside Park. We've become addicted to their[experts] certainty, their assuredness, their definitiveness, and in the process, we have ceded our responsibility, substituting our intellect and our intelligence for their supposed words of wisdom. We've surrendered our power, trading off our discomfort with uncertainty for the illusion of certainty that they provide. I had a conversation with someone the other day about what we are trying to do here with this website and these conversations. "A Place in Mound", in part, is meant to challenge the status quo. It's time to for our city staff and council to step up and make decisions with their own facilities that are best for our community. People parking on the street on Commerce near Our Lake of the Lake. It is safe, and makes for a better place. 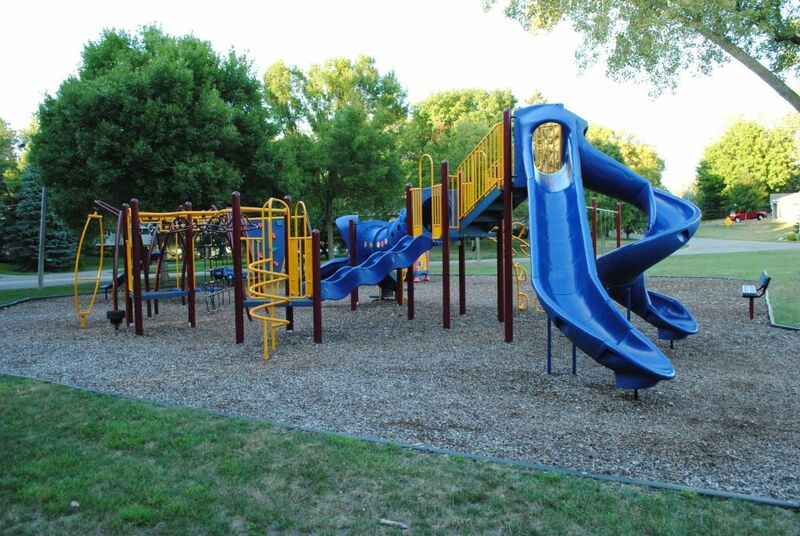 Today's park spotlight takes us to a medium sized neighborhood park on the west side of town. Philbrook Park has a lot going for it. A nice newer playground, picnic tables, drinking fountain, backstop, basketball court, wide open field, benches, and a flag pole! A large flat field. 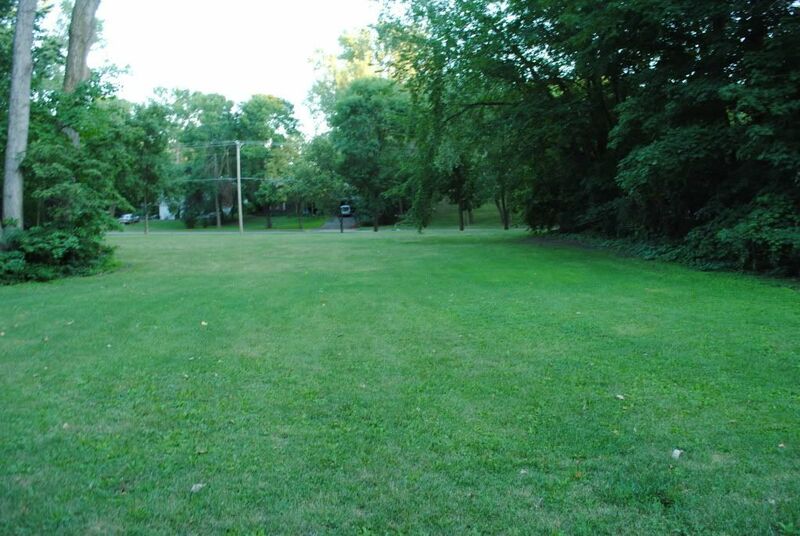 A great place for soccer, or to play catch with the dog. The tree is nicely lined with older, and newer trees along the street. One of two no parking signs... my impression was one wouldn't be allowed to park anywhere along the curb of the park. Yes, the 'No Parking' signs were here too. I know the city made a huge effort a few years ago so the 'No parking' signs made sense for the city, I suspect public safety reasons. But choking residents and park users of reasonable use of our streets in the name of giving fire trucks space for the one time is needed might be overkill. The city needs to relook at on street parking in general. 2nd no parking sign, not actually on the park, which is the next block ahead, but seems to be clearly saying don't park next to the park. Another thing I found interesting, all the houses were substantial in size, and had huge front yards. One had the feeling the park really wasn't needed. Nice, full size basketball court. 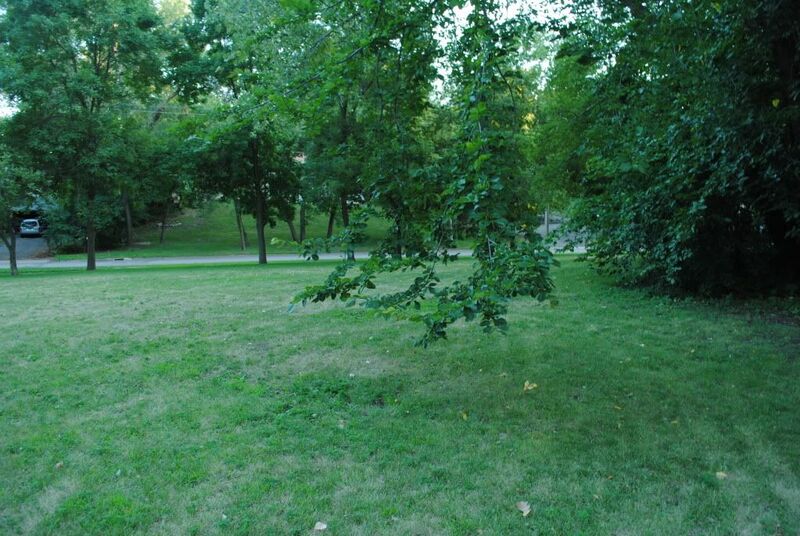 But the park itself as lots of great amenities, and is clearly valued by the city, and the neighborhood. 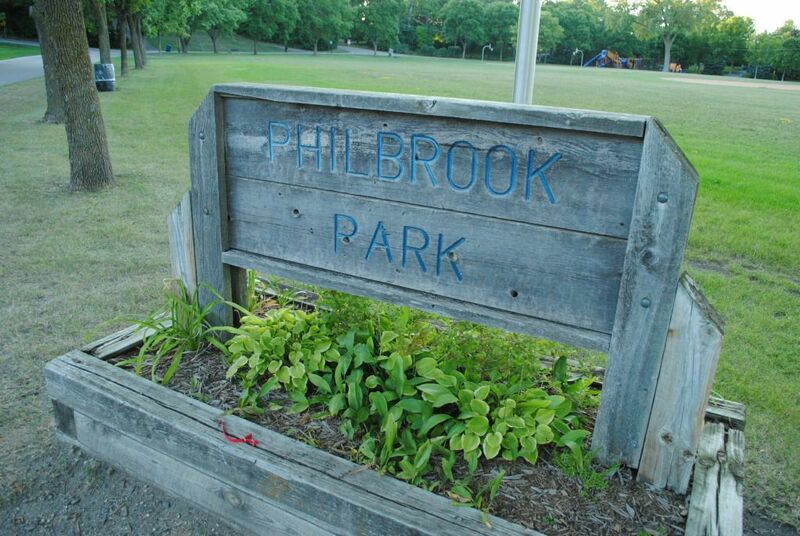 It's clear to say Philbrook Park is a great place in Mound! You can find it just a couple blocks north of Lynwood Boulevard on Southview Lane. Go check it out! The mayor (around 1:45) has recently said that the "Vision" for a pedestrian downtown in Mound didn't work, and he's taking steps to change them. He continued that the idea of a 'Mixed Use" district has been tried and is failing all over the place, and doesn't work today. The realigning of Shoreline Drive created the Pedestrian District, and so now people don't have to cross the busy street anymore. From the Mound Harbor Renaissance documents. Are these guys around to defend their 'vision'? This issue is raised because it's clear something is going to happen along Auditor's Road in the next year or two. It sounds like the mayor is getting frustrated, like we all are, that nothing is happening. A massive parking garage was constructed so that the developers and city would be successful in attracting a restaurant to the area, but that was unsuccessful. The mayor seems to be suggested the "Visions", nice as it was, fell short, and the idea is '20 years old' and won't work today. I would argue that perhaps it fail because of the economy. 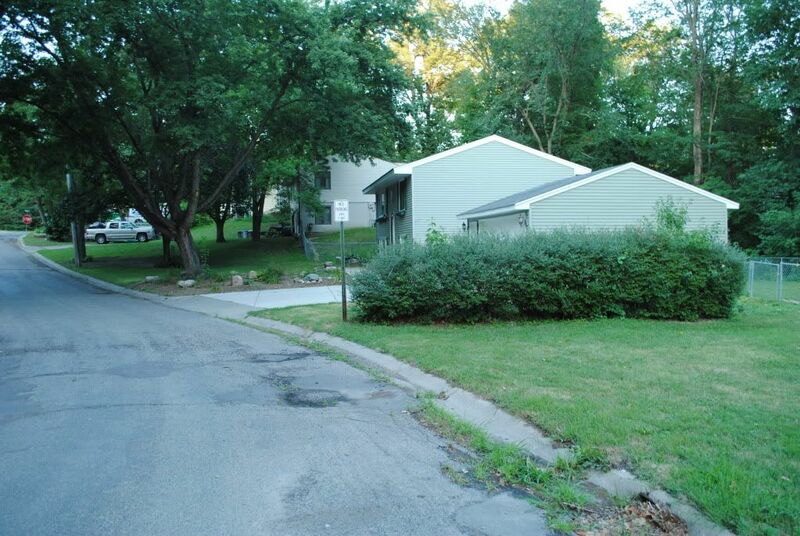 There are lots of empty lots and space throughout the west metro that is auto centered that hasn't worked. 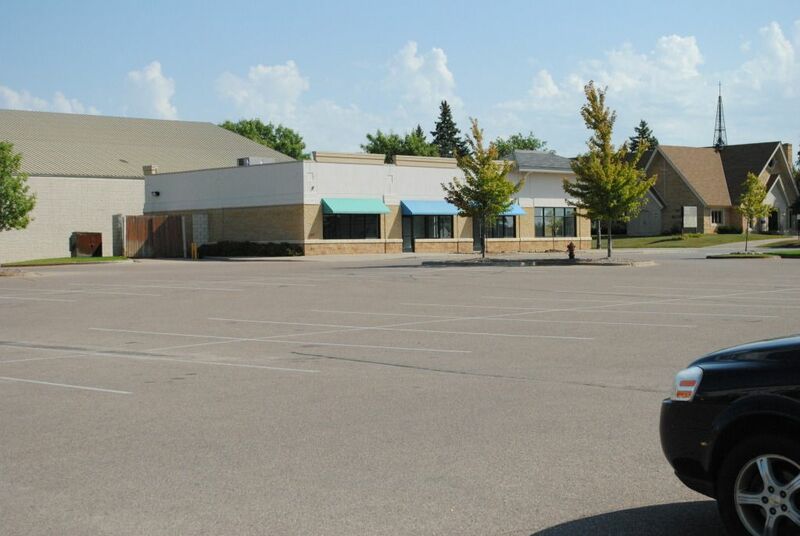 Look around the retail space at Target in Waconia and the empty, practically abandoned undeveloped large acre resident lots in Minnetrista. Things came to a stand still for everyone. 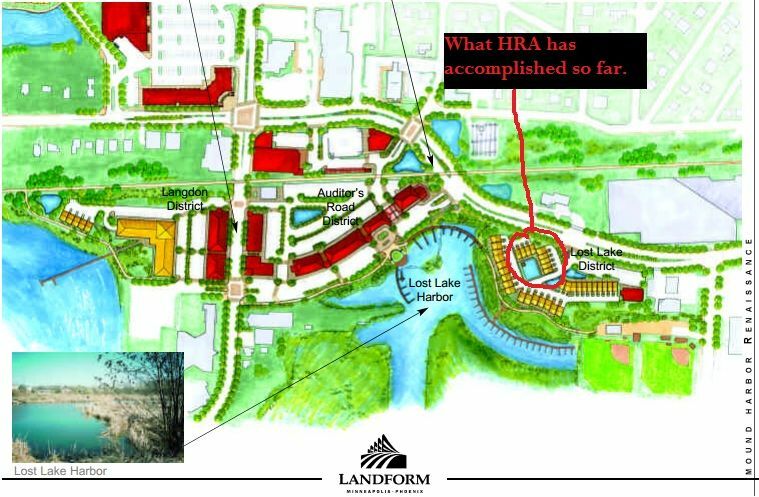 The HRA plan, it's only accomplishment was the Lost Lake Villas, and those were foreclosed. 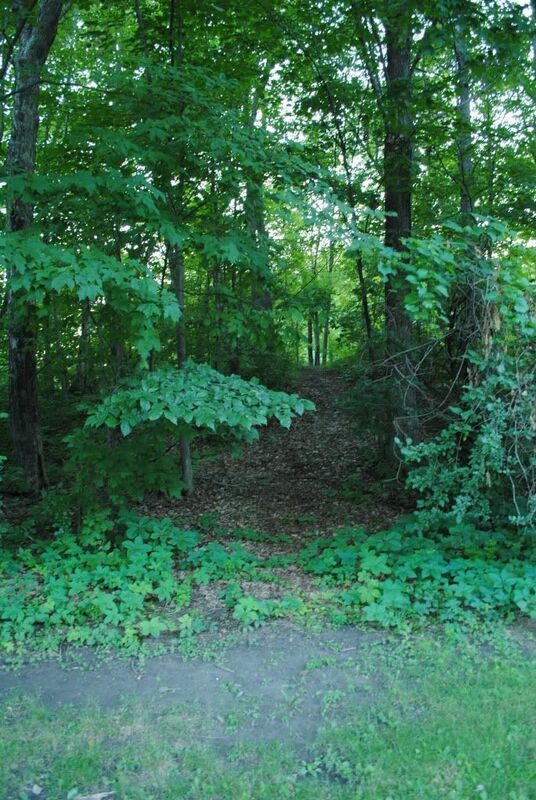 Mound has a very precious jewel in the space along Auditor's Rd that's been unappreciated for a long time. 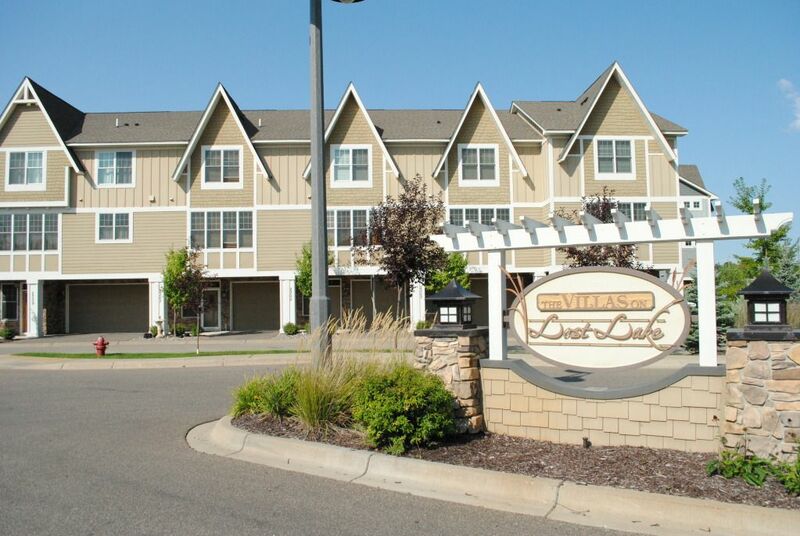 It's next to the largest street intersection in the immediate area, is next to the parking garage we constructed, and the Dakota Rail trail. I know some cities would love to have a blank slate like this to rebuild a downtown around. Do we just hand ours over to the next person who asks for it? Does Mound throw away years of careful deliberation. There is A LOT invested on these properties, and I'm not only talking about road construction. Huge updates in storm sewers and utilities were made, lake restoration, public docks, Auditors Road itself, acquiring property. It is important that the city is capitalizing on these investments with efficiency. 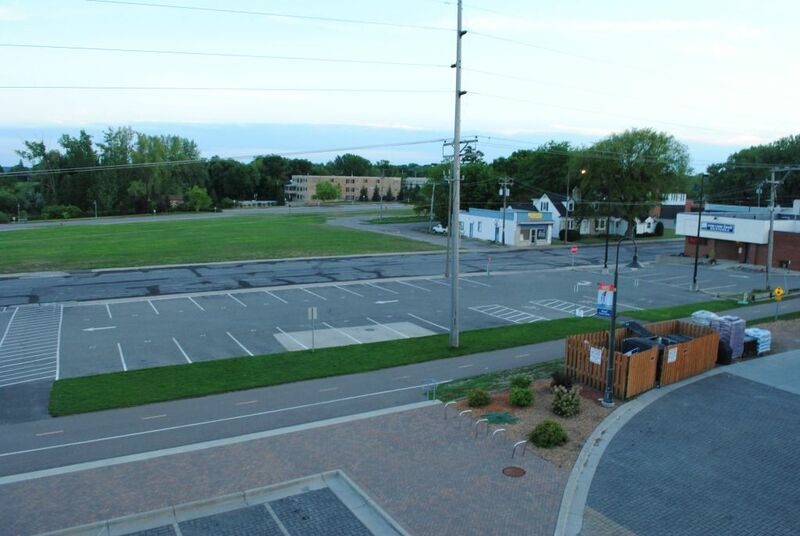 What is the better payoff for the city; parking lots, or real property developement. This not only means having successful businesses and residences, but making the most of the space in revenue generated for the city. So finally the question is this... What kind of "Place" will Mound Harbor District" be? Celebrate Greater Mound is a local organization devoted to making Mound a better place! Mostly businesses, and organizations, it also includes a few individuals that focus on events and places of business in the Mound area. It allows people to coordinate, share information, and put together fantastic events for the people of Mound! Making Mound a great Place! It's this wonderful organization that organized and produced all the wonderful banners we have on our street lights about town, Dog Days, and now they organize the Christmas Tree lighting festival. See! Anyone can be in Celebrate Greater Mound! The monthly lunch meetings are interesting. They give everyone a chance to introduce themselves and highlight recent and upcoming events. A member or two will get a chance to showcase their business or organization. Other fantastic events held by Celebrate Greater Mound is the Moonlight Trail walk held in February along the Dakota Rail Trail. They do a fantastic job of setting up booths and fires along the trail, giving people a chance to enjoy a pleasant walk, and getting a hot chocolate. Perfect timing too, as we enter the doldrums of March. Looking ahead, Celebrate Greater Mound next big event is the Scarecrow stomp. The town will suddenly be decorated with scarecrows of all kinds along downtown, and place of businesses. They are collaborating this year with the Westonka ECFE Stroll-a-thon, and the Farmer's Market. That gives all a chance to support each other and make the greenway a great PLACE! Scarecrows start popping up in September. You don't have to be a business to join, sign up as an individual or as a family, and support our places of business, and volunteer a little time to an event. You won't regret it! One thing that is clear as one studies the places of our cities and neighborhoods is how auto centered our lives have become... so much that we are essentially forced to get in the car. We drive to the park. We drive to get lunch. We get in our cars to get the milk we forgot. We drive our kids to the school. We drive them to the little league field. We drive to Jubilee for a few groceries, and instead of walking the short distance and walking through traffc, we get in our cars, and drive to Mound True Value. Commerce/Lynwood - a divider, or a uniter? We build a Walgreens so cars can easily access it, but make people walk and bike all the way around the building to get to the entrance, and call it 'pedestrian friendly'. 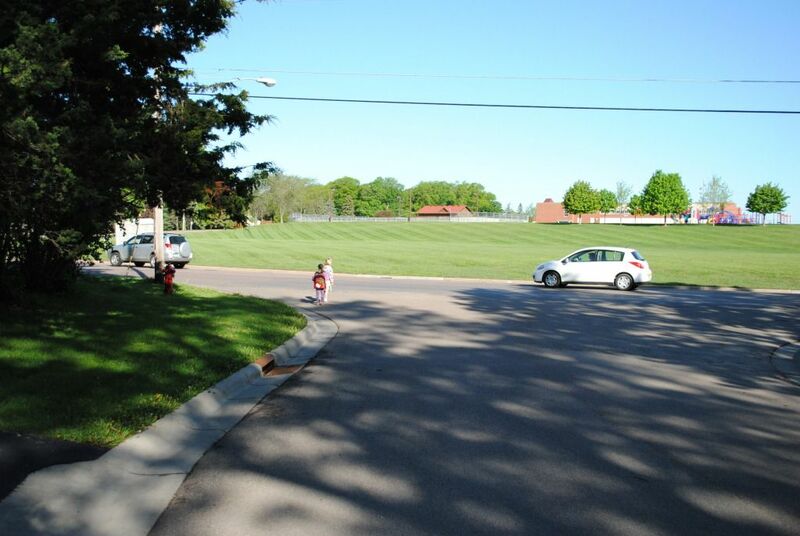 We deny on street parking for parks because it's more important that cars drive through fast. We redesign the trail crossings forcing bicyclist to stop, in part, so the cars who don't think about crosswalks have an easier time driving through Shoreline. We of course have choices, but what kind of choice? What do you choose when you go from Jubilee to True Value? What do you choose if you get to Surfside late for a concert, and are forced to park two blocks away on Bartlett? What do you choose when you live 3 blocks from your local school, but have to cross one of our Boulevards? How do you choose to get to your fitness center? Wilshire Blvd by Shirley Hills School - A great place to drive through, what about a place for students to get to? How do you get to these places? Are we REALLY given a choice? It's up to us to demand to be given a real choice. We are saying that it should be just as easy and safe for walkers and bikers to get to Mound places, as it is to drive. We have an opportunity to make our voice heard at the County level next week. 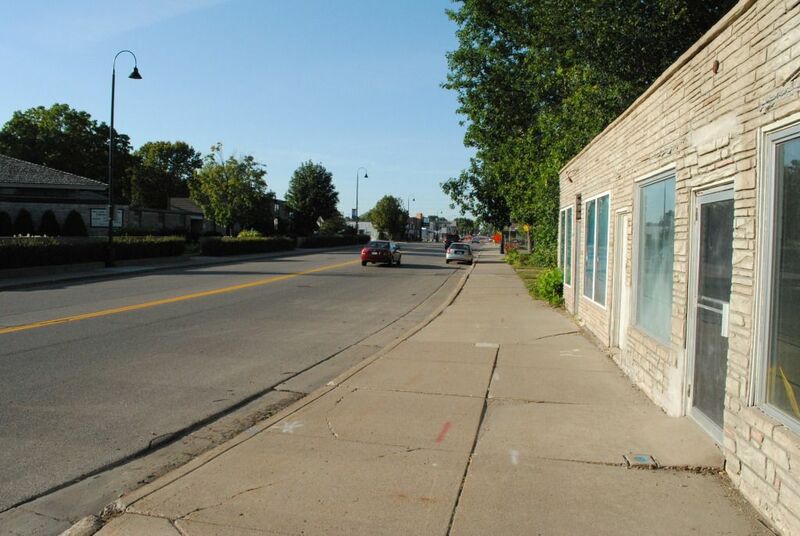 The county is in the process of creating its first official pedestrian plan. The goal is to increase walking and pedestrian safety throughout the county’s roadway system by creating a plan that will include strategies to support walking through infrastructure, facilities, enforcement, education and evaluation. This is a county meeting, so it's not only Navarre issues they will be hearing about, but communities all around the lake. Anyone want to bike with me to the meeting? We've said before that Mound city streets are very important to Mound places. The way they connect our neighborhoods to downtown, and local communities is important to our livelihoods. 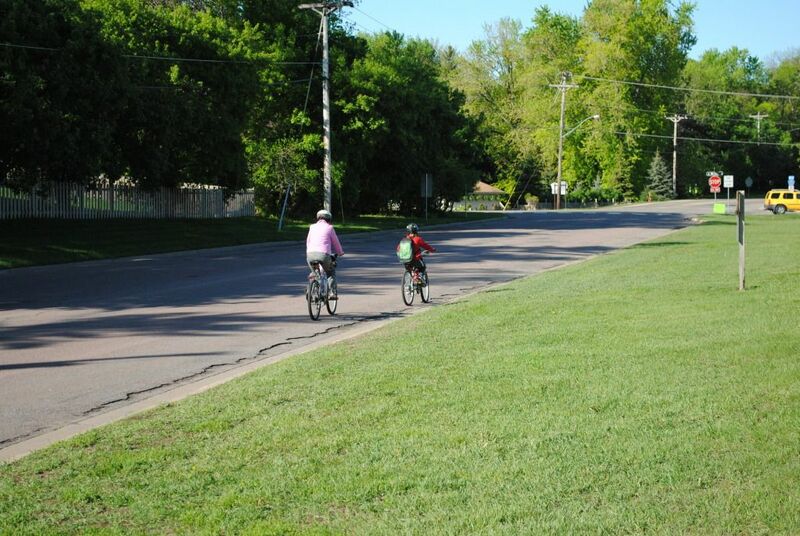 Bartlett Blvd by Shirley Hills - Mom bikes with her child to school. Frankly, there are lots of issues with many of Mound's 'Boulevards' like Tuxedo, Wilshire, Three Points, and Bartlett. Unless you are driving by at 40 mph you just don't feel like you belong there! As someone who regularly walks along these roads with small children, it is often a stressful situation. Many of us have been raised in a culture where cars are king and stay out of their way. Now we have built our streets like this, and are made to feel bad if we get in a cars way. Bartlett Blvd - Does this really connect places? Bartlett Blvd from the stop sign on Wilshire, to Shoreline Drive is a city street that acts like something bigger. Many of it's users are just those who use it as a shortcut from the Commerce/Bartlett intersection, to Shoreline Drive. I don't blame them. It's wide, flat, and cars are not allowed to park on much of it, though that gets confusing at times. The only thing that slows them down is that its in rough shape. It's due to be reconstructed in 2015. 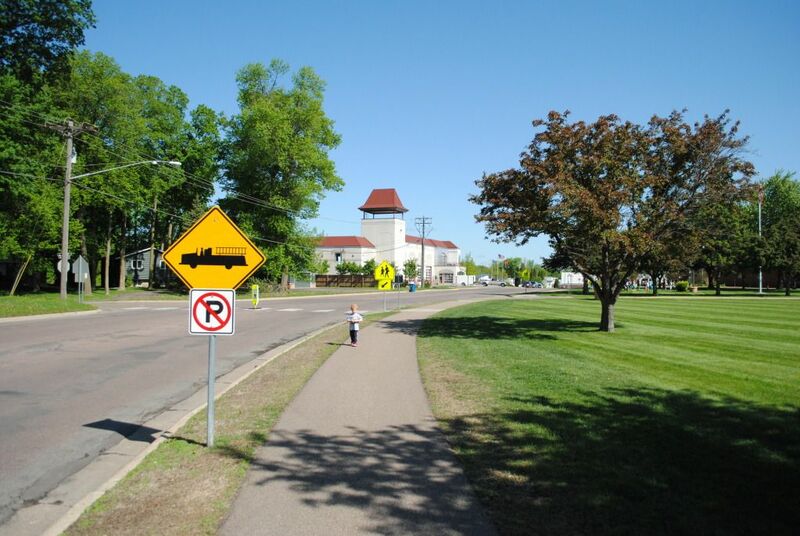 MN Statutes 169.21 PEDESTRIAN - "every driver of a vehicle shall (1) exercise due care to avoid colliding with any bicycle or pedestrian upon any roadway"
Of course, Bartlett is a neighborhood street, where lots of families live, and has a city park, and Shirley Hills school. I know for a fact many pedestrians (or, as I call them, People) limit their exposure to Bartlett. 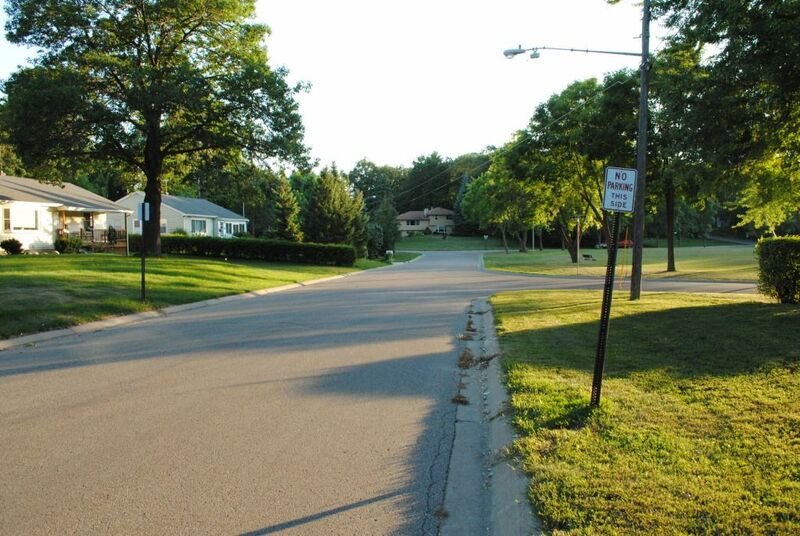 Most families drive their kids to school regularly, instead of exposing them to this street. 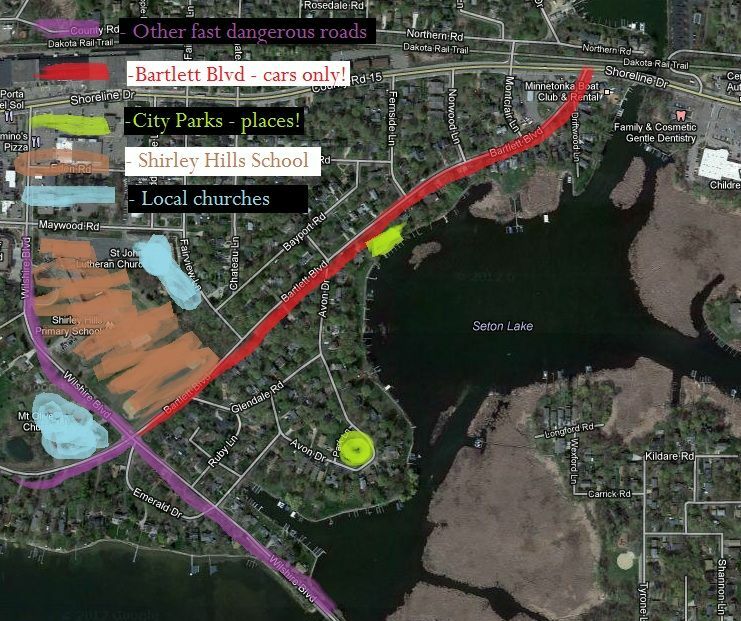 Bartlett may make a great connection for people to drive from Minnetrista, to an office in Plymouth, but it's a terrible place if you want to walk to the local school or church. And that's the point. Bartlett Boulevard is not a great connector for the neighborhood, but a wall, dividing people from the places they might want to go. Mound needs to rethink it's streets, and make them available for EVERYONE. I meant to share this last week. "A Place in Mound" and our video discussing the issue of on street parking at Surfside was featured on the Strongtowns video channel. Strongtowns is a great place to hear more about what people are doing to create better communities, and I strongly urge you to check them out. And if you are new to our website, perhaps you haven't seen the video yet of one of our key issues for Mound! 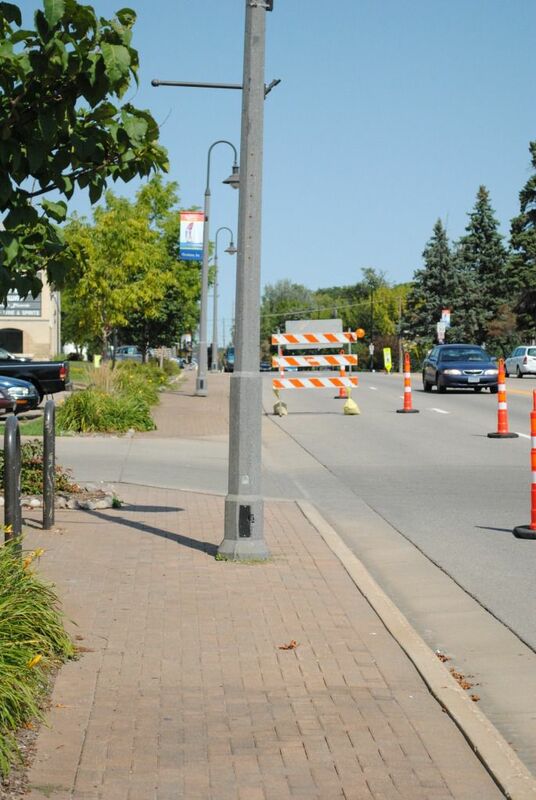 Is ANYONE suffering because of the lane reduction that is happening on Shoreline during the trail crossing makeover? Please let me know, because I have long doubted that four lanes of traffic are really needed on that stretch, and I haven't seen any problems this last week. Please email me your comments at gmlfour@gmail.com. 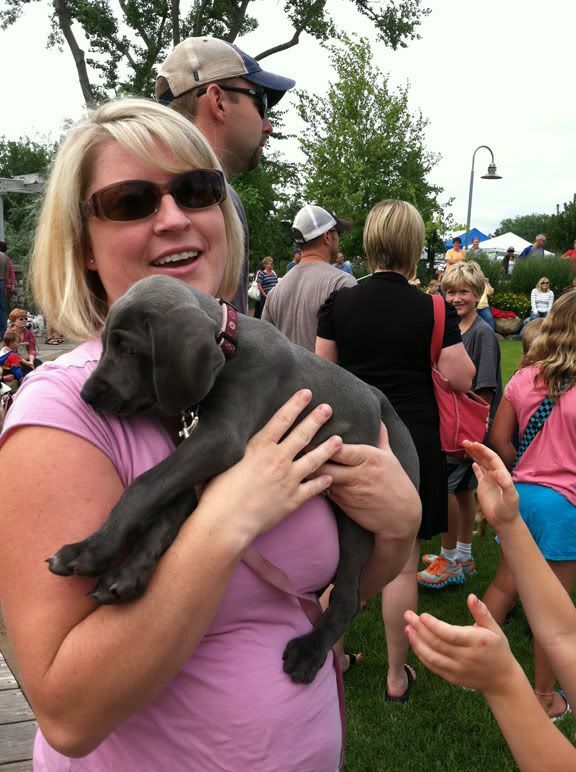 Dog Days Westonka - This Saturday! Don't miss this great event on Saturday along Audtior's Road! Can a city without a Police Department be a place? The Mound City Council is having a public meeting Thursday evening during it's City Council meeting discussing the future of the Mound Police department. For over a year the city has done an extensive study with it's neighbor, Minnetrista to share police departments. There were negotiations, which fell through a couple months ago. Over the summer, negotiations started with Orono about contracting Policing duties through that city. It's clear from the city's latest newsletter the priorities of the city are continuing policing services at current levels, and keeping the budget at it's current level. If the city were to continue it's own Police department, cost would rise because of the need to hire a Police Chief and another position. raising costs significantly. MPR has coincidentally started a series of stories about public safety in Minnesota cities. Lots of good reading here about what other cities are doing. An interesting fact I learned... Crime is down from the early '90's but everyone perceives that's it's worse! I also did a broader search about about ways of dealing with police department budgets. There wasn't a lot to find besides stories about cities contracting or sharing services, but I did find this study done in New Jersey with a nice comprehensive list. Lots of ways and ideas about how a city might go when looking at restructuring it's police services and budget. A safe place in Mound. 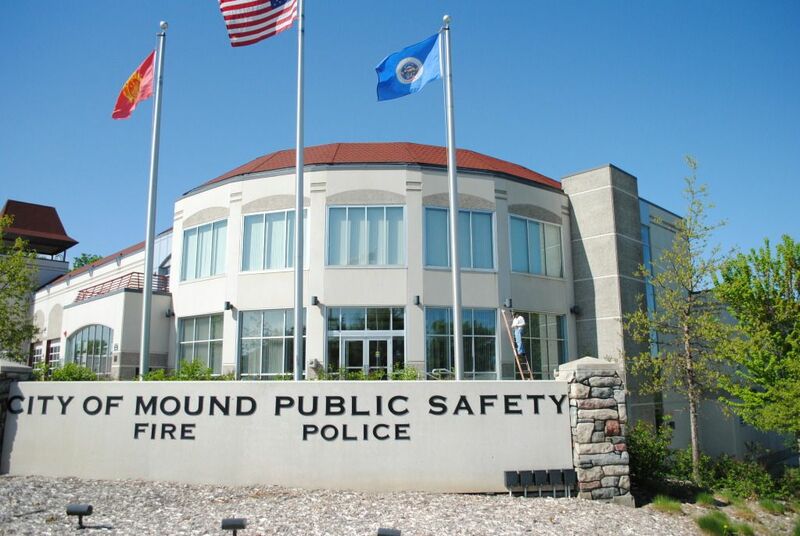 The Mound police/fire facility was constructed in 2004. The study completed in 2011 for the Minnetrista/Mound police services suggested the facility wase well designed and sized correctly for Mound 's needs. However, it also advised that if the Mound and Minnetrista department's consolidated, the Mound facility would not be needed. It sounds like the city is discussing a contracting service with Orono. 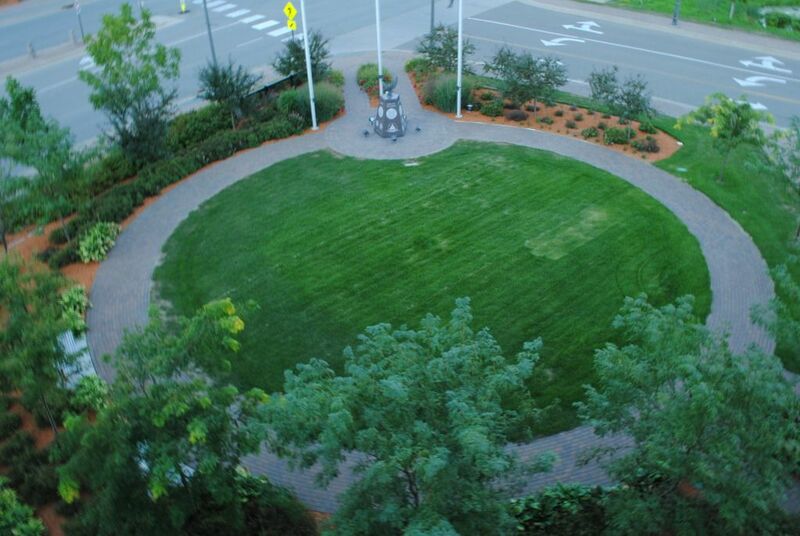 Where does the Mound facility fit in with a relationship with Orono? How important of a place is the Police Department? The Mound Police Department is a place I myself have to frequent very little. My daughters have probably been there more often than I have because of school tours of the facility. It is nice to have a place close when it is needed. It's nice to see our police officers at city council meetings giving updates. How much of this will continue if the city contracts out to Orono? Again, the mayor and the city have said, service levels will continue, or be enhanced, while holding the budget at current levels. These are tough choices our city council and staff need to make, and Mound is not alone in these decisions. Cities all over Minnesota are struggling with these choices, and frankly, they are going to get tougher. State and federal money is drying up, so cities are relying more and more on the taxes they collect. This is part of the reason "A Place in Mound" was created. Mound has many wonderful places. 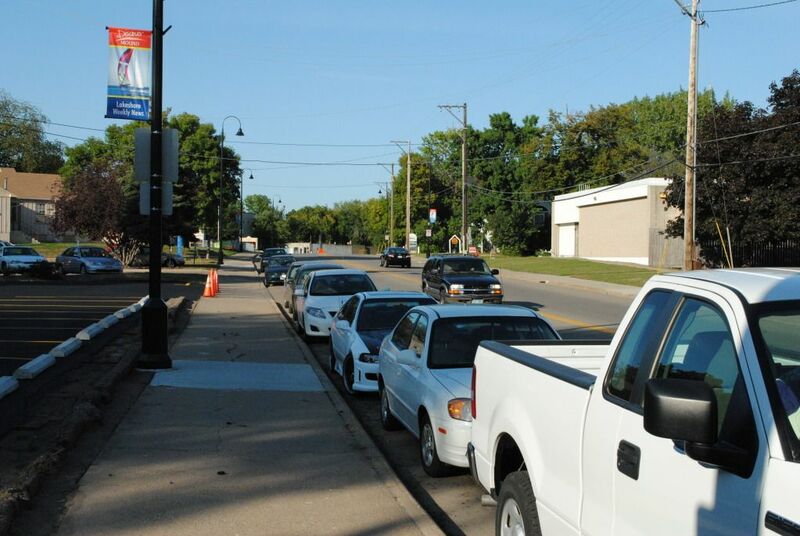 It is important that the people of Mound appreciate, utilize, and improve our Places. In doing so, the city will be able to better leverage it's finances and overall budget. 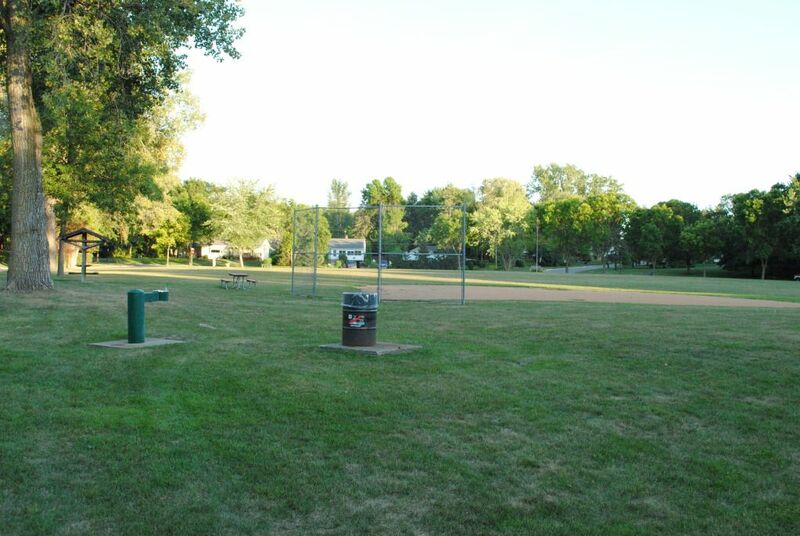 Doone Park - Potential Place in Mound. Someone at least is tending the flowers here. 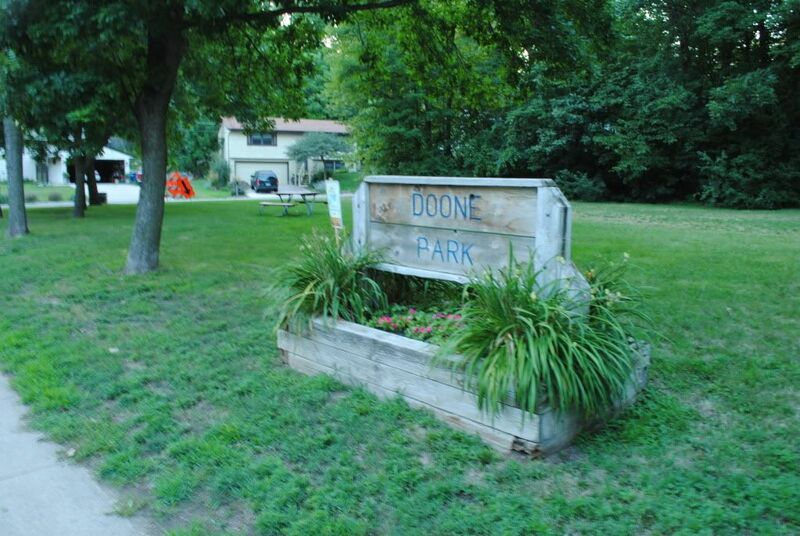 Doone Park is a nice size park on Tuxedo Blvd. 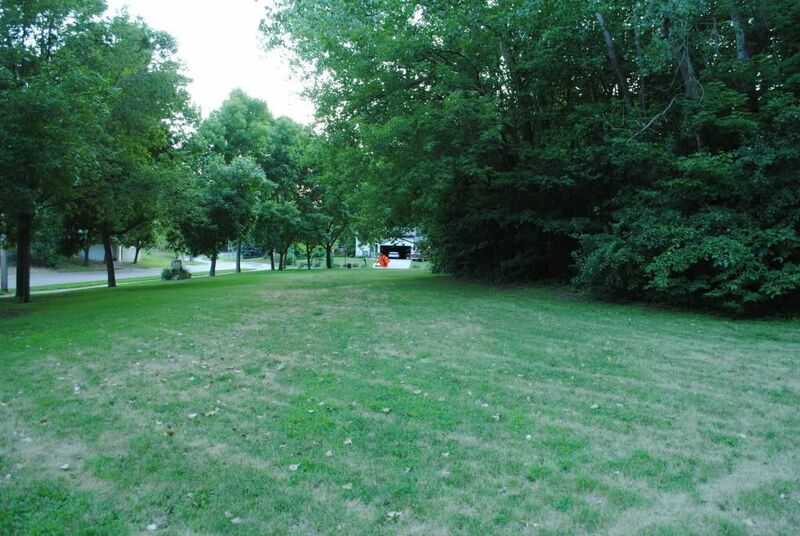 It's highly visible with a nice size flat field and a small wooded area and a picnic table. One notable thing it lacks though... now say it with me... "On Street Parking." If you've been enjoying "A Place in Mound" please be sure to share the webpage with your friends and 'like' us on Facebook! A city park surrounded by "No Parking" signs. It would be possible to park across the street. I was stunned to see how difficult it would be to park here. One can park on the residential sides of the street, but then you have to be careful of not blocking driveways, and the space is more limiting. This doesn't make much sense to me. The only potential places to park is next to homes on Donald and Gordon. No parking on Tuxedo. Tuxedo is one of Mound's main 'arterials' that offers most residents on the island assess to the county roads. Tuxedo, like other the other boulevards in town, are wide and flat, and encourages cars to drive fast, which they do. 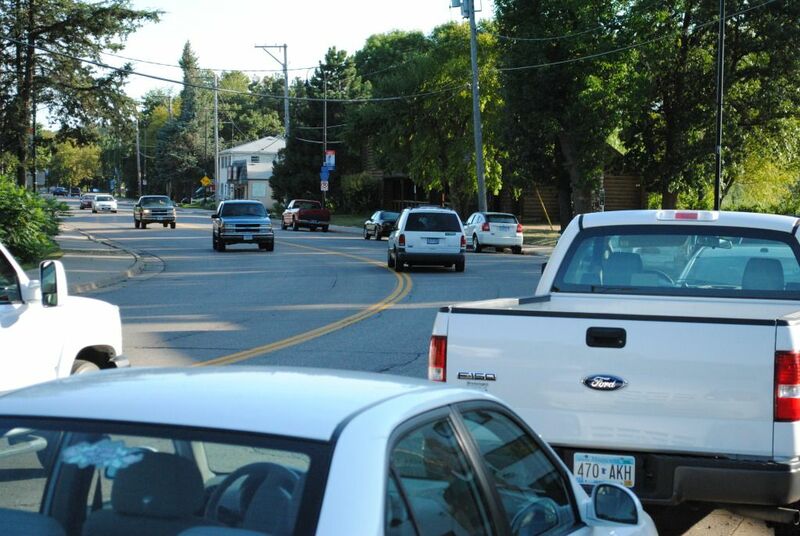 There is room to walk and bike, but with cars whizzing by, you generally don't want to be on the road with them. I believe you are not allowed to park on Tuxedo, though I don't drive on it enough myself to know for certain. Path through wooded area. Someone must play here at least. 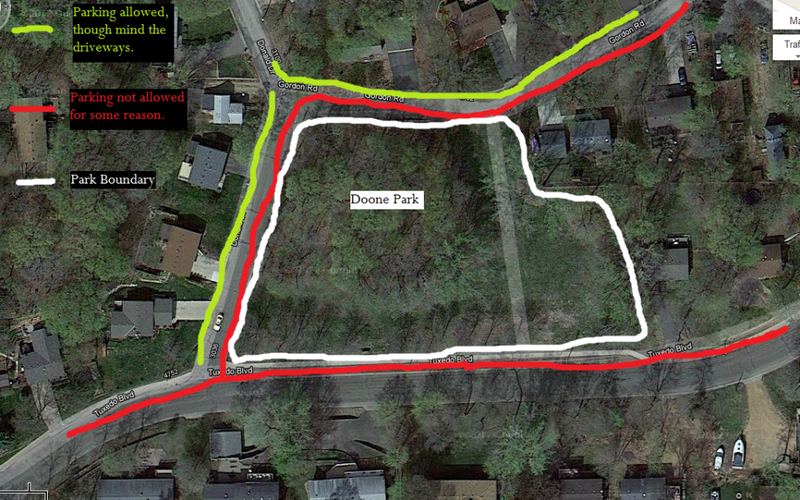 Doone Park is clearly meant for the neighborhood, though there is little evidence it is used. No stray toys or balls were seen. It is pretty, and a sidewalk runs along Tuxedo. Low hanging branch, seems like some kids should've ruined this branch long ago. Is this park enough for the neighborhood? For the city? I was a bit surprised there was no playground here. History shows the property was acquired in 1993. Shouldn't there be something here besides a picnic table? Nice line of trees along Tuxedo Blvd. We are lucky to live across the street from a small city park. Almost always the first or second thing off visitors lips is "Wow, you are so lucky to live next to a park like that!" Are the residents next to Doone Park lucky to live there? Public access from Gordon Rd. 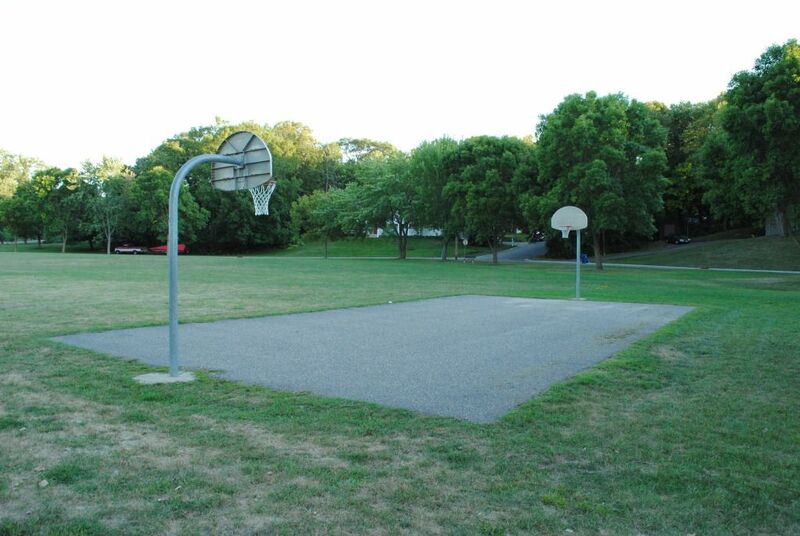 Imagine how much more attractive a place like this could be with a simple swingset, or backstop, or just a small ashpalted area with a basketball hoop. They wouldn't cost much money, and they would improve the ambiance of the whole area! And the city clearly needs to take a second look at the parking situation here. It is crazy if one were to drive here, and see nothing but "No Parking" signs. Another inspiration for "A Place in Mound" is this video and Better Block. Great examples of taking an underutilized city street, and making it a "Place." with long term impacts. Definitely worth seeing. Often when I talk about Mound to people who may not have even heard of it, if I just mention the Al and Alma Dinner Cruises people will light up, and realize they had been to Mound, to get on Lake Minnetonka via the Dinner Cruise. 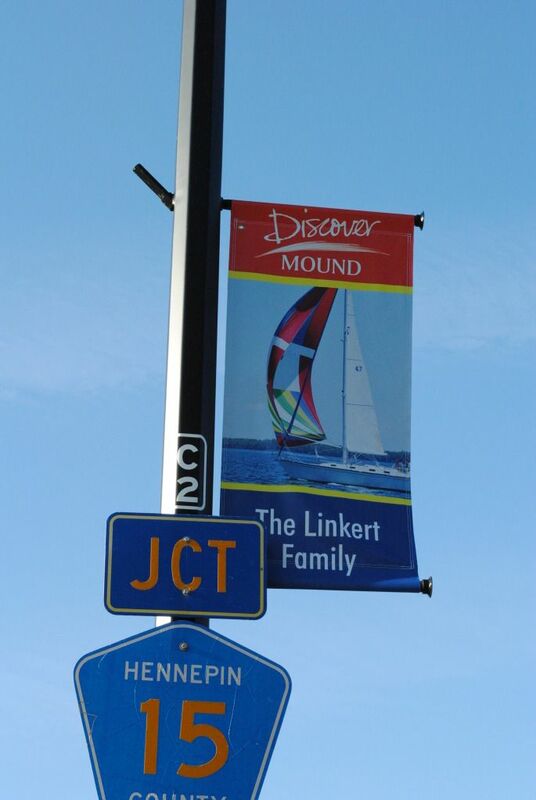 Most Minnesotan's often grow up with fond lake experiences of one sort or another, but it's nothing like an experience boating on Lake Minnetonka. After passing through bay after bay, the rider will eventually realize how immense the lake is. Most boaters on the lake end up boating to Fletchers (Spring Park), Maynards (Excelsior) or Wayzata. Anyone who boats on Lake Minnetonka doesn't think about going to Mound. 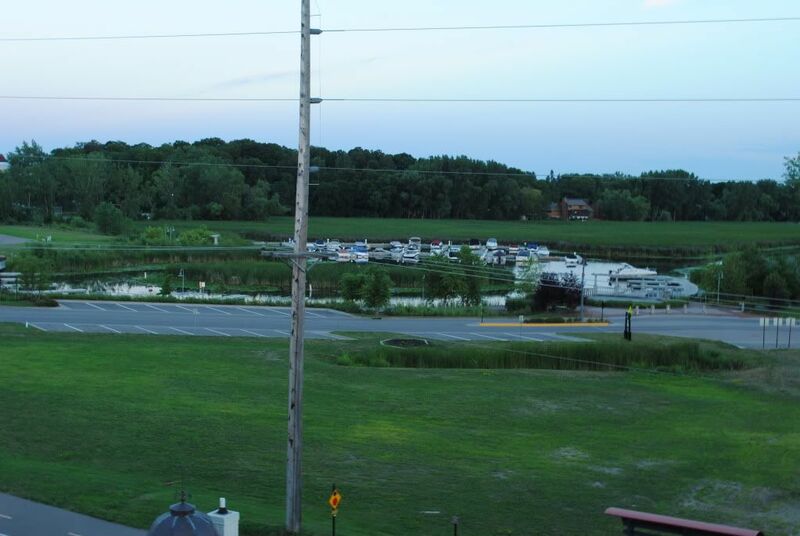 It's clear there used to be places on Lake Minnetonka in Mound like the old Surfside Casino, and lake hotels. But those have been gone for a long time. Mound has been desperate to bring the lake community to it's stores and parks, tearing down a huge part of it's old downtown, redirecting a county road, and restoring some gorgeous wetland area and bring new public docks. Unfortunately this all happened right before 2007, and with the economy tanking, Mound sits with a big empty lot right on the lake. It's not much of a place now. I feel bad for city officials when they get asked about this at meetings. It's clear they want something to happen along Auditor's Rd more than the rest of us I suspect. "Runners swarm to the lakes," said Jessie Mosier, assistant manager at the Running Room outlet in Burnsville. Although she loves the options at home in Dakota County, she gets the attraction, including the safety factor: the comfort you feel when there are lots of people around and it isn't just you in the suburban woods. Is there an opportunity for Mound here? We have Lost Lake, whose shorelines, for the most park is owned by the city, or the county. In it's Comprehension Plan, the city does have a vision of creating a trail that goes completely around Lost Lake... clearly the Andrew Sisters Trail is a start to this idea. 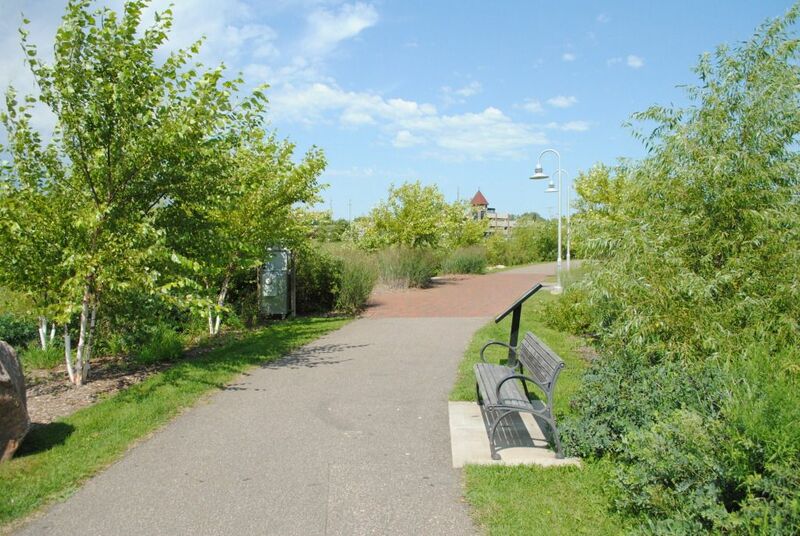 Think of all the wonderful connections a trail like this would make for our city between the Dakota Trail, the new development that will happen along Auditor's Rd, Surfside, the Gillespie Center and businesses and residences along Commerce. All within an pleasant stroll along Lost Lake. How can we make Mound a Place on the lake? 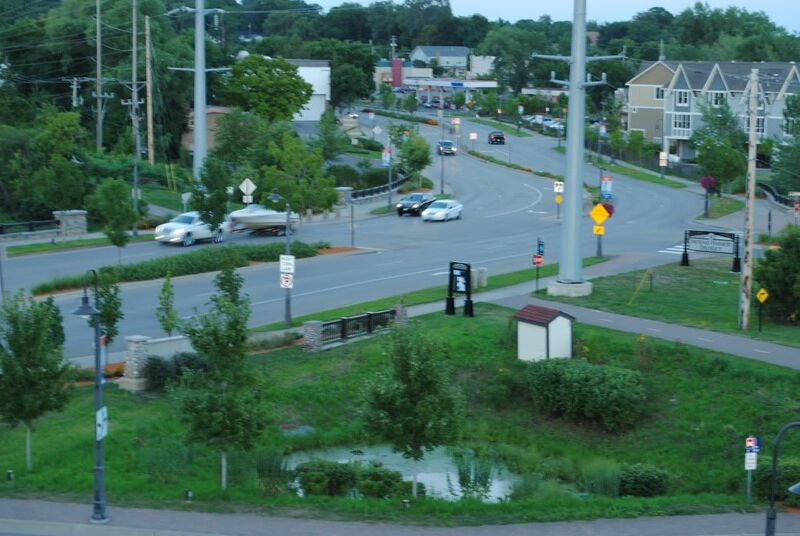 The Dakota Rail Trail crossings have been a hot topic over at the Mound-Westonka blog. Of course we want a safe place for people to come to, and the trail crossings are important. There are interesting changes happening to have it safer for trail users. Essentially, the focus is on making those that are going west and crossing Shoreline Dr, to make a sharper Z turn, like what happens if you are going east on the trail. The detour is diverting trail users to go up to the Lynwood/Commerce intersection, and head east on Lynwood, along the north side of the old Tonka factory, and get back on the trail at Fairview. Strongtowns is one of the main inspirations for the creation of "A Place in Mound". It's all about building and having a community that is flexible and self-reliant in a rapidly changing world. We were fortunate to have a Curbside Chat from them here last Winter. This video is a TEDx where Strongtowns executive talks about our cities and the economy of today, including places that make our cities strong like streets. I strongly urge you to checkout Strongtowns.org and follow the conversations there, and on their Facebook and Twitter accounts. As we said before, it's great when we got things happening on the Greenway near Auditor's Rd. The Mound Farmer's Market is a great example of this. But things get REALLY cooking when Celebrate Greater Mound comes into play! 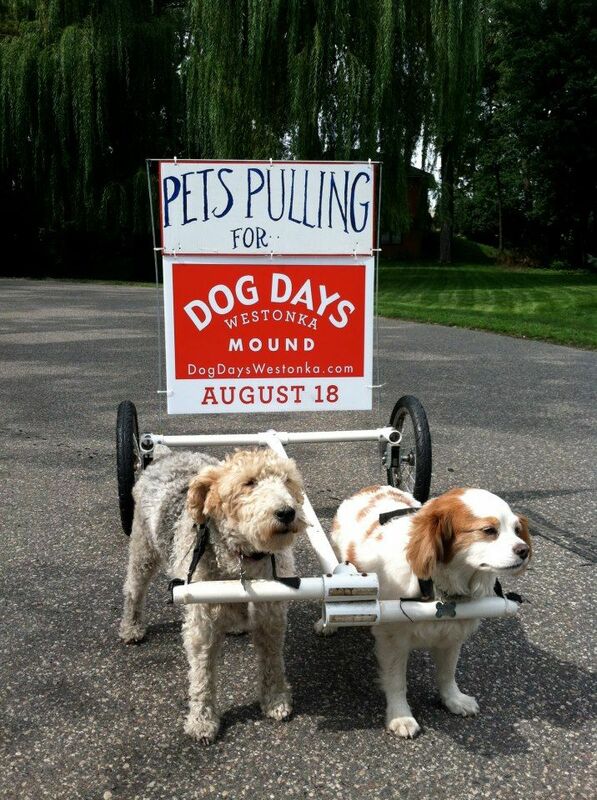 On Saturday Aug 19, Celebrate Greater Mound is organizing Dog Days Westonka. I remember when I started seeing the signs last year for this event, and had NO plans to check out the festivities. But that Saturday, I did take my daughters to the Farmers Market, and since everything was set up, we went walking through the booths to check out the sights... I was blown away! I'm generally don't like dogs, but my kids LOVE them, and we happened by while the "Cutest Puppy" contest was happening. My kids were right there with all these other kids petting the puppies as they were paraded by, and couldn't have having more fun. I was awestruck at all the people and businesses that were enjoying themselves... it made Auditor's Rd, a great place that morning. Lots of cool things happening that morning, I have to think the highlight will be the startled faces of the sheep from Gale Woods Farm as they will be meeting REAL sheep herding dogs! Have fun and "Like" their Facebook page! 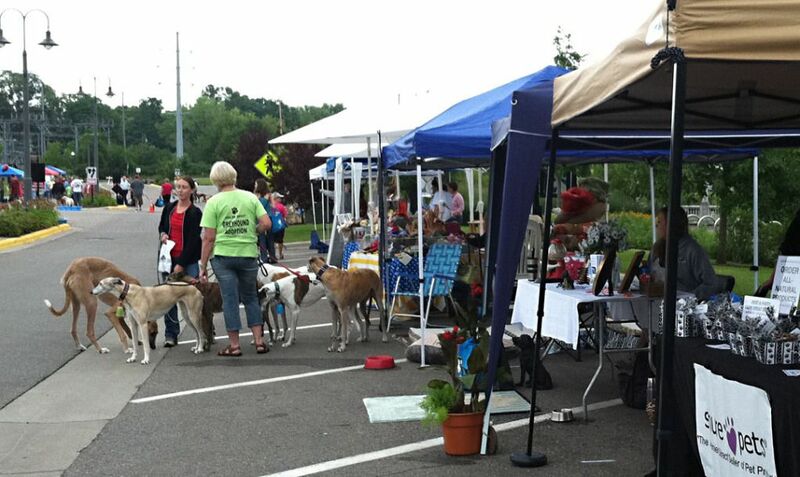 So you should definitely stop by Dog Days Saturday, Aug 19. I'll be working the Mini golf event!